and am pretty pleased with myself over it. 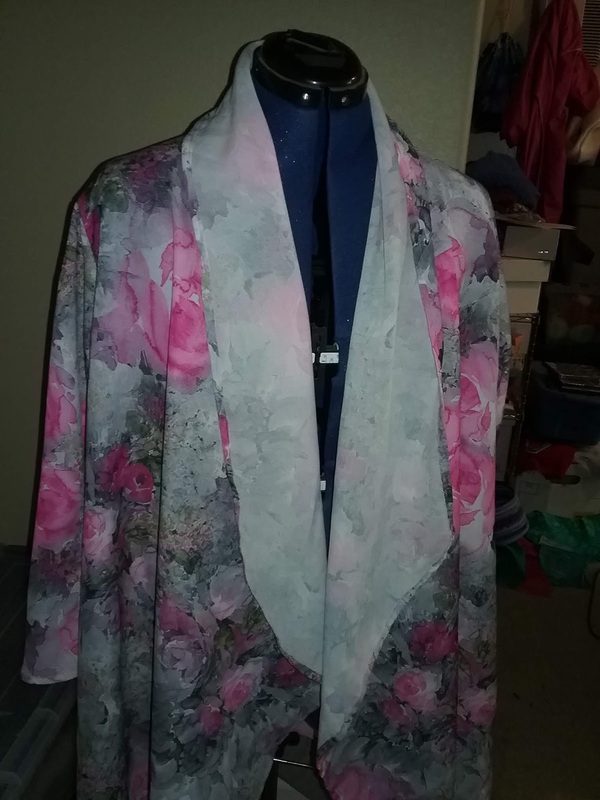 Now I know to use temporary fabric stiffeners when working with horrible fabrics, but this was started prior to that knowledge, and because the fabric was cut in such a wonky manner, I had to go back to Joanns to get more fabric and even the extra fabric didn't allow for the other collar piece. Usually when something is this frustrating, it stands a good chance of learning what the inside of the food processor looks like, but I put it away until I could face it again, then actually found it after the move! There's hope for my sweater wips yet! with some accompanying fabric to finish them, but at least it wasn't more fabric than I used up during vacation. This is probably progress. and this is when one can REALLY tell the difference with the new machine. I used a walking foot on my Husqvarna to do the initial rows, but the stitching is still uneven and wandering and kind of awful. 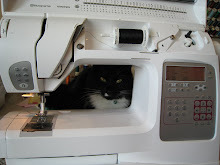 With the walking foot on the new machine, it's much, MUCH smoother--even with kitty assistance. which was supposed to be the same shape as the tan one, but ended up a bit more "artistic." Still, the colors are great, so no one need know that it wasn't intentional. He's done some quite impressive snarls while embroidering in the past, but this might be the biggest one ever. 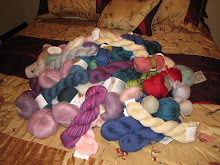 It's probably half the bobbin, which took some doing. Overachiever. I finished both jackets and think I'm ready for a break from any sort of fussy fabric, stiffened or not. 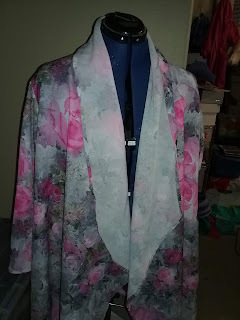 The chiffon jacket has some serious mistakes at the shoulder, but ripping them out would destroy the fabric, and no one will ever see them unless they are looking, and I'm going to guess that a flowing chiffon jacket is going to snag on things and not last too long anyway. 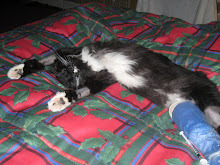 I bought the fabric on clearance for $6, and even stiffened, chiffon might not be worth it. The second one was just finished last night, and it's a crepe that stiffened nicely. I loved the fabric when I first saw it but refrained from ordering it for at least a couple months, which is sort of a record for me. I am usually more of a bright-color person, but I think this will be lovely, maybe with a pink shirt and grey slacks? I think this now makes TEN of these jackets, so maybe it's time to find another pattern to explore............? Lovely, and hope all went well with new job day 1! I love your new clothes Toni. Hope your first week at your new job was wonderful.